You’ve probably seen these Magnetix building toys before. They feature small plastic bars with magnetic endpieces that attach to steel balls to form three dimensional structures. 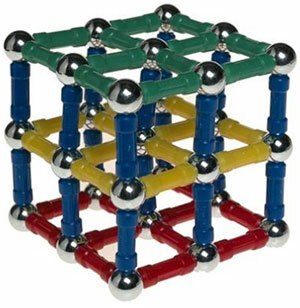 Magnetix is made for children, so the pieces are large and easily manipulated by small hands. I ordered a few sets from Amazon three years ago, and just threw them all out. A while back Magnetix sets were recalled due to the magnets coming loose and posing a choking/internal injuries hazard. The sets I ordered were made after the recall. Last night I pulled out the Magnetix pieces after maybe a year or year and a half in storage. I stored them in one of the original steel containers, all in a jumble. When I started pulling the magets off of the steel balls, some of them started to fall apart. It looks like each magnetic bar contains magnetized iron filings beneath a fragile barrier at each end point. When pulling the plastic bars apart, the end “caps” broke off, exposing the iron filings. Iron filings are not usually magnets themselves, but can transmit magnetic fields. In hindsight, I believe that there may be magnets embedded deep within the plastic bars where they cannot accidentally fall out, with the filings extending their field closer to the bar ends. After separating the balls from the bars, I had many tiny pieces of metal flake on my fingers, and magnetic filings exposed on many of the bars. This is unacceptable, so I kept the steel balls and discarded the plastic magnetic bars into the trash. I’m not saying that this building toy is flawed as I can’t think of a better way to build them, but if you have any and plan to store them for long periods of time, make sure to separate the balls from the magnets first. Luckily I have other magnet building “toys” that I’ve been busy with – more on that later. This is useful to know. We also own this toy and actually supervised our kids when playing with it to ensure they swallowed neither the silver balls or the magnetic sticks. Eventually, we just decided to put them all away since we occasionally have kids over our house who are younger and the bold colors in these toys make them an attractive chewing target. Ours are currently packed up somewhere in one of our rubbermaid tubs out in the garage. Next time we’re cleaning out, I think we’ll just dump these to the recycling. It’s also worth noting that iron poisoning is a real problem, at least with kids accidentally overdosing on iron-containing vitamins. I wonder if the filings themselves represent some type of risk if kids were to eat them? I don’t know if iron filings are dangerous, but they’re certainly messy. If I recall correctly, Magnetix used to attach magnets at the ends of the little plastic bars, but they had a tendency to fall off, prompting a recall. I imagine that embedding the magnet(s) deep within the plastic bars helps prevent separation and accidental ingestion. I assume that loose magnetic iron filings are potentially less harmful than loose magnets, but it presented much more of a hassle than I wanted to deal with. With no children in the house, I now keep a set of Zen Magnets on my desk.